Travel + art | Dubai: an art lover’s dream? When I mention Dubai as a travel destination what do you think of? Famous skyscrapers and opulent seven star hotels? Fountain displays below the Burj Khalifa? Shopping malls and sunshine? Well, what about arts and culture? Over the last decade Dubai has been establishing itself on the international art scene. A city made on sand, Dubai is making up for its own lack of heritage by importing and celebrating culture. So, what should you do in Dubai if you’re into art and culture? Is it worth visiting? I definitely think so. During a week in Dubai (including a day trip to Abu Dhabi) my prejudices about the United Arab Emirates were replaced with a feeling that this is somewhere quite special, which places value on and invests in the arts from across the globe. Here are my top tips on the best things to do in Dubai and the UAE, and what art to see. Art Dubai is an annual celebration of art, design and culture, which usually runs over several days in March. 2018 saw over 100 galleries from 48 countries exhibit objects from emerging art scenes, alongside pictures from traditional European galleries. The fair also puts the spotlight on art from the Middle East, North Africa and South Asia. Other art fairs in Dubai include: Quoz Arts Festival, which gives visitors the chance to discover the local arts scene; MOCAfest, the arts and culture festival of the World Islamic Economic Forum; and Downtown Design, which showcases everything from furniture to lighting, textiles to new technologies. In May 2006, art market history was made when Christie’s Dubai held its first auction of International Modern & Contemporary Art in the Middle East. Since then, Christie’s has gone on to sell over $215 million worth of Middle Eastern art in Dubai. Then, last year, Sotheby’s held its inaugural sale, ‘Boundless: Dubai’ from its new offices in the Dubai International Financial Centre. It presented new perspectives on art from, and inspired by, the Middle East. The sale raised an impressive $3,622,875. The auction house is committed to offering an extensive programme of sales and exhibitions, which you can view even if you’re not quite wealthy enough to bid! The Middle Eastern art market is definitely booming. I was surprised to find out just how many women from the Middle East are integral to Dubai and the Emirates’ art scene. The majority of art institutions, galleries and residency programs are founded and run by women. For example, Mouna Atassi and her sister Mayla ran an art gallery in Syria for modern Syrian artists; with the outbreak of war she fled to Dubai, forming the Atassi Foundation as a home for the study of Syrian art. Mouna presented the exhibition ‘Syria Into the Light’ in Dubai last year, a show exploring Syria through its people and artists. D3 is Dubai’s design district. It’s the trendy home (across 11 buildings) to creatives, fashion designers, advertising houses, and also has exhibition space. It aims to inspire and showcase emerging talent and provide a platform for Middle Eastern artists and designers. There are several galleries including Gallery Ward, Citizen E Gallery and Sconci Art Gallery (Dubai’s first gallery of Italian art). Want to mix your art interest with a day at the beach? Then La Mer is the best spot for you. Think street art-styled beachside bars, shake shacks and coffee houses covered in graffiti. Yes, it’s a little bit tacky, but once you’ve had a chocolate hazelnut milkshake from London Dairy and a swim, you won’t mind. Also, I most enjoyed people watching: it’s a very eclectic bunch of expats and locals who like to spend their day by the sea. Museums more your sort of thing? Around a one hour drive from Dubai is Abu Dhabi, and I highly recommend the trip here for the Louvre Abu Dhabi. It is spectacular, both for its collection and the architecture of the building itself. Prize-winning French architect Jean Nouvel designed this stunning museum medina, which is set within the sea, and kept in the shade under a vast silvery dome. Composed of almost 8,000 unique metal stars set in a complex geometric pattern, the dome echoes Arabic calligraphy, as well as the overlapping palm trees in the UAE’s oases. When sunlight filters through into the galleries below, it’s mesmerising. And within 23 rooms you’ll discover a world-class collection of objects (many on loan), presented beautifully in thought-provoking exhibitions. In contrast to traditional museum displays, which separate objects from different civilisations, the Louvre Abu Dhabi connects cultures. You might have 3 sculptures, side by side, which highlight artists’ shared interest in depicting drapery across Italy, India and Iran. I love this approach which focuses on universal themes and ideas, from religion to modernism, spanning centuries and civilisations. This museum highlights how arts and culture has the power to connect us. 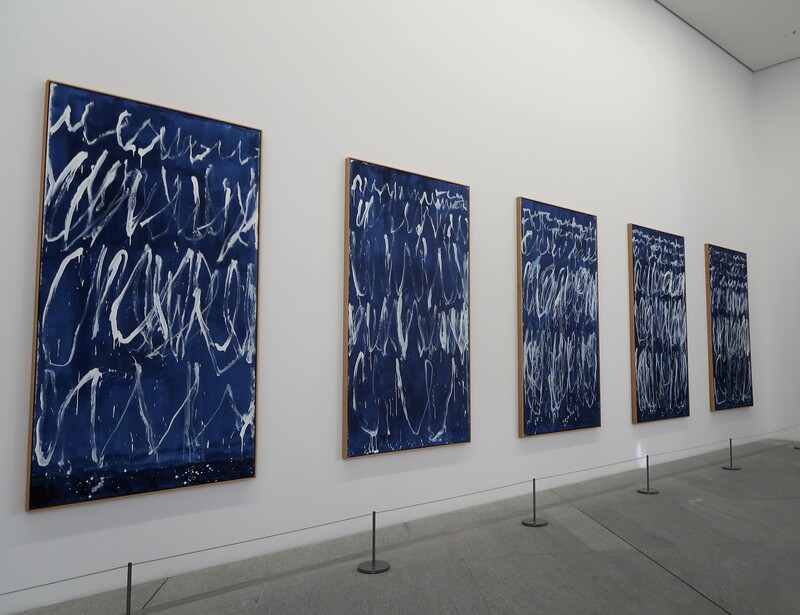 The museum also won me over immediately with the impressive collection of Cy Twombly canvases at the entrance. It does contemporary just as well as it does classic. So, what are you waiting for? Emirates fly direct from Birmingham to Dubai in around 7 hours…. I know I’ll be back, ideally in March for the spring art sales week. See you there?